In June I made a visit to Cambridge University Library, where I spoke to Laura Nuvoloni about the Library’s project of upgrading and publishing online the cataloguing of its incunables. Almost by chance, Laura mentioned a problem or puzzle that had just arisen with regard to three Alberti editions in Italian, his Ecatomfila, Deifira, and an anonymous prose version of his Storia de Ippolito Buondelmonti e Leonora de’ Bardi. 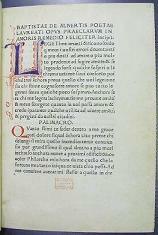 All are quartos, and the first two are explicitly dated to 1471. In Oates, they are entered as 2327-2329 respectively, under the heading “Florence: Printer of the 1471 Mesue.” The “title” work of this press is the folio edition of Johannes Mesue, Opera medicinalia, explicitly dated 9 June 1471 (Goff M-509, HC 11107, BMC VI 615: IB.29848). In 1898 Proctor grouped these four editions plus a quarto edition of pseudo-Phalaris Epistolae in Italian, 1471 (Goff P-566, H 12903*), all printed with the same type, under the heading “Without place or printer”, with a remark on the type: “resembling in many ways Venezia, clij., A § 1 [that is, the Printer of Basilius, De Vita solitaria]; but all the connections of this type point to Firenze” (Proctor 7344-7348). The type was shortly after reproduced by the Type Facsimile Society, pl. 1900z, from the British Museum copy of Phalaris, and the plate is captioned “Unknown press in Italy, perhaps at Firenze, 1471.” In 1905, in the catalogue of Pierpont Morgan’s early printed books edited by A. W. Pollard, the suggestion of Florence became positive, and so also in BMC VI, 1930, edited by Victor Scholderer. But it is hardly unknown to incunabulists that Roberto Ridolfi’s La stampa in Firenze nel Secolo XV (1958) has a chapter “Lo Stampatore del Mesue e l’introduzione della stampa in Firenze”, in which he argued decisively against the “British Museum” position (this chapter being a revision of an article he published in La Bibliofilía, 1954). 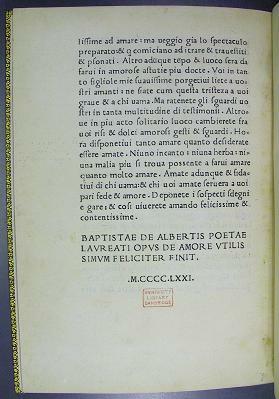 By Ridolfi’s evidence, the Printer of the 1471 Mesue was certainly not in Florence, and almost certainly was to be identified with the Padua printer, Laurentius Canozius, whose first explicitly signed and dated edition is an Aristotle text, printed with a rotunda type, completed 22 November 1472. 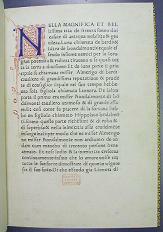 That is, if Ridolfi is correct, Canozius precedes Bartholomaeus de Valdezocchi (first dated work Boccaccio, Fiammetta, 24 March 1472) as the prototypographer of Padua. A powerful clue to the reassignment is a 1472-dated purchase inscription by one Eusebius de Chochis found in a copy of the Ippolito e Leonora: “… In patauia emi eum [or eundem?]. opus Magistri laurentii de lendenaria” — I purchased this in Padua: the work of Master Laurentius [Canozius] de Lendenaria.” (cf. Ridolfi, La stampa in Firenze…, cit., p. 39, fig. 8). Among those who agreed with Ridolfi’s new evidence and interpretation was Victor Scholderer, who in the office copy of BMC used for the 1963 photolithographic reprint, wrote marginally, vol. vi, p. 615, “This printer was probably Canozius at Padua, q.v.,” — and then struck through the word “probably”. In fact, the Mesue-type editions would appear to be a long-settled problem. The reassignment of the group to Canozius in Padua has been accepted by such major incunable catalogues as CIBN, BSB-Ink , and Bod-inc (many more catalogues could be cited, were there any purpose to doing so), and no evidence opposing it has ever been published. For Laura, this created an unavoidable conundrum. All three editions sat together on her desk. They had arrived at the Library as the gift of Charles Fairfax Murray in 1916, and although each is now bound in uniform twentieth-century blue morocco, they had originally formed a Sammelband, with uniform decoration and consecutive foliation. Nor does it take an unusually keen eye to see that all were printed with a single type, whoever and wherever the type’s owner may have been. How could two of them possibly be Milanese productions, and the third Paduan? I had the pleasure of examining the three editions, and noticed that they were printed on a single paper stock, watermarked with a Crown in a circle. As was quickly discovered upon consulting Ridolfi, this was the chief among five paper stocks found in the Mesue, and Ridolfi had already recorded that this stock was used also in the three Alberti editions (cf. Ridolfi, La stampa in Firenze…, cit., p. 33, fig. 2). A small addendum can be made to Ridolfi’s elegant, one could even say classic, study. 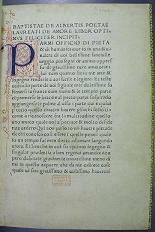 The Mesue is a folio on Median (Mezzana) paper. 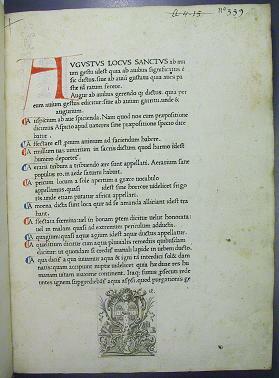 The three Alberti editions and the pseudo-Phalaris are Median quartos, printed on divided half-sheets of paper. In Studi offerti a Roberto Ridolfi (1973) Dennis Rhodes, “Ancora per lo Stampatore del Mesue,” added a sixth edition to the Mesue group, the Oratio ad Nicolaum Tronum of Jacobus Aragazonius, whose text is dated 23 November 1471. This rare quarto, printed on Chancery and not Median paper, had been lurking unnoticed in volume II of the Gesamtkatalog der Wiegendrucke since 1926 (GW 2308), and as Rhodes observed, the GW editors, long before Ridolfi brought full clarity to the problem, had noticed difficulties with the localization of the Mesue Press to Florence (cf. 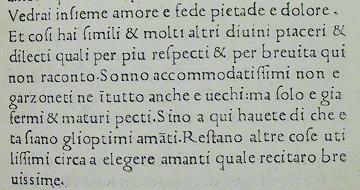 Rhodes, “Ancora per lo Stampatore del Mesue”, cit., p. 407-412, with reproduction of f. [a1] recto). In the first volume of GW, 1925, Alberti’s Deifira and Ecatomfila (GW 576, 577) had been assigned: “[Florenz(? ): Drucker von Mesue, Opera (Hain 11107)]”. But in the second volume, GW 2308 assigned the Aragazonius Oratio: “Oberitalien. Drucker des Mesue …”. No explanation was given, but the cause of the change of location is clear: Aragazonius was a professor of philosophy at Padua, and his Oratio congratulated Niccolò Tron on election as Doge of Venice, 23 November 1471. How could Florence plausibly be the place where this “local” writing was sent to press? In 1943, the first volume of IGI listed the Aragazonius edition as item 777, taking over GW’s localization: “Italia settentrionale”. IGI’s four Italian copies, not known to GW, strengthened the evidence for a north Italian printing place: one copy each in Milan, Brescia, Padua, and Venice. But IGI’s handling of the Mesue Press was not entirely sure-footed, for the same volume, items 150 and 151 (Alberti), located the same press to “[Firenze? ]”, again following GW. Literally interpreted, both GW and IGI were asserting that the “Printer of Mesue” was probably a wanderer. It is more likely however that neither set of editors noticed their own inconsistencies. GW, at least, did not attempt to reconcile the differing attributions of place in the “Ergänzungen und Verbesserungen” to volume I that was issued with volume II. In any case, ISTC’s press assignment of the two Alberti editions to Zarotus in Milan is incorrect, and needs rectification. The source of the error is obvious. Within its program of expanding bibliographical citations, ISTC has recently been incorporating references to Arnaldo Ganda’s 1984 Primordi della tipografia milanese: Antonio Zarotto da Parma (1471-1507). Ganda’s “Annali” of Zarotus’s editions includes the Deifira and Ecatomfila as items 4 and 3 respectively. They are placed in the group of items — the first six numbers of the list — assigned to the shop of Pamfilo Castaldi 1471 to early 1472, for whom Zarotus at this time worked. The inclusion of the Alberti editions in the Castaldi list is entirely mistaken. Specifically, Ganda claims that these six items are all printed with the same type, 115R, whose first dated use was in the edition of Festus, De verborum significatione, Milan, 3 August 1471 (Goff F-141, H 7038*, GW 9864; Inc.3.B.7.1). And indeed items 1, 2, 5 and 6 of Ganda’s list are printed with this type, and may all be seen as printed in Castaldi’s shop. However, the two Alberti editions items 3 and 4 are printed not with this type, but with the 119R type of the Mesue Press, a type conspicuously different in appearance from Castaldi’s, character by character. The two Alberti editions are cuckoo’s eggs in the Castaldi nest. The three editions can instead be securely assigned to the Printer of Mesue, i.e. Laurentius Canozius at Padua and have been accordingly catalogued by Laura for the online catalogue of Cambridge University Library (Inc.4.B.74.B.1; Inc.4.B.74.B.1; Inc.4.B.74.B.1). How did the Alberti editions come to be assigned to Castaldi-Zarotus? Courtesy of Ludwig Hain in 1828, it seems. For the Ecatomfila, Ganda gives the bibliographical citations as: “H 420 (A. Zarotto); BMC VI, 616 e IGI 151 (Padova, Lorenzo Canozio); GW 577 (Firenze, tip. 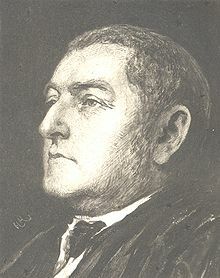 del Mesue).” Thus, Hain was seen as a superior authority to GW, BMC, and IGI. In view of the massive reservoir of typographic classification and reproduction available to these twentieth-century catalogues (Proctor, Haebler, Type Facsimile Society, Gesellschaft für Typenkunde), this seemingly ultra-conservative preference was in fact extremely bold. If the type used to print the 1471 Alberti editions truly was Castaldi type 1, how probable is it that GW, BMC, and IGI would all, successively, have failed to notice this? And it may be worth noting that Ganda’s monograph does not include a reproduction of Castaldi type 1. Ganda’s reference to BMC VI 616 as assigning the editions to Canozius in Padua shows that he consulted the reprint edition, with Scholderer’s revised opinion moving the editions from Florence to Padua. Scholderer’s two notes in BMC VI (pp. xii and 615) do not specifically refer to Ridolfi’s study; for that reference one must turn to Scholderer’s associated note in BMC VII, p. xxxix, where Canozius’s press is reviewed. This suggests that Ganda knew from BMC VI that an attribution to Canozius had been made, yet was unaware, because of not consulting BMC VII, that the attribution rested on evidence and analysis provided by one of Italy’s greatest bibliographical scholars. And so it is that in 2010 a press attribution made by Franciscus Xavier Laire in 1791 is, in the guise of updating, silently brought in to override an exemplary bibliographical analysis made in 1954, revised in 1958, and concurred in by a long series of incunabulists of the last two generations. In recompense we have an answer to a hitherto unasked question: where did the assignment of the Alberti editions to Zarotus come from?